Where do Rio de Janeiro's crime guns come from? Guns kill. The impacts of a bullet on human bone and tissue can be devastating. Survivors face lasting physical and psychological damage. If every gun death is tragic, then Rio de Janeiro is experiencing a tragedy of monumental dimensions. The situation is all the more horrific since most gun deaths are entirely preventable. The good news it is that gun-related violence has declined in Rio de Janeiro since its peak in the 1990s. The bad news is that by global standards, the situation is dire. In 2015, there were 4,197 intentional homicides in the state of 15 million residents, a rate of roughly 25 murders per 100,000 people. Around 1,200 of these killings occurred in the state capital of Rio de Janeiro - the venue for the 2016 Olympic Games. Most of these murders were due to disputes between rival gangs, petty criminals and intimate partners. As recent reports by Amnesty International and Human Rights Watch have shown, a sizable number (some 644 in 2015) were a result of police interventions. 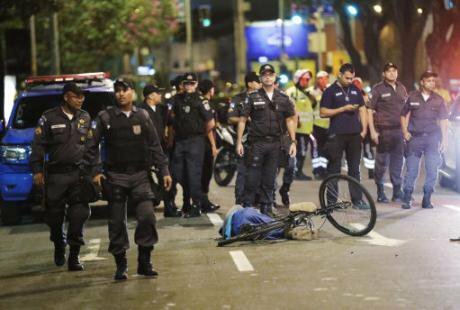 The vast majority of Rio de Janeiro’s homicide victims succumbed to gunshot injuries. Over 71 percent of the state’s murders in 2015 were committed with firearms. What kinds of guns are doing the killing? An inspection of the firearms and ammunition seized by Rio de Janeiro's military and civil police departments provides some insight. Just over 80 per cent of the 8,956 firearms seized by law enforcement agencies in 2015 were revolvers and pistols. The rest comprised a smattering of shotguns and carbines. Less than one per cent included sub-machine guns and automatic or semi-automatic rifles. From January to May of 2016, another 3,943 firearms were collected by police, most of which consisted of pistols and revolvers. These latest trends are remarkably consistent over time. There were just over 154,000 firearms collected by police between 2001-2014. The high-water mark for firearm seizures in Rio de Janeiro came in 2003 when over 15,000 guns were retrieved from crime scenes. Between 2008 and 2014, the numbers oscillated between 7,000 and 9,000 per year. The proportion of these consisting of revolvers and pistols hovered at 80 percent, with less than two percent including heavier weaponry. Identifying the type of firearms used in crime matters. Contrary to the claims of some government officials, most guns used in homicide were sourced from Rio de Janeiro or neighboring states and not from neighboring countries. Although many seized guns have their serial numbers physically erased by a previous owner, three quarters of those with the markings left intact can be traced to a relatively small number of private security companies and civilian owners registered in Rio de Janeiro. Weapons are routinely leaked and stolen from the arsenals of the Brazilian police and armed forces, albeit in smaller quantities. For example, Brazilian police have reported losses of Colt (.223) and Taurus (0.40) handguns while FN rifles (7.62) have also been recovered with markings from the Brazilian marines. There are relatively few reported cases of military-style firearms and ammunition going walking, but they still represent a risk. According to some sources, Brazil's armed forces have an estimated surplus stock of around 800,000 firearms. The caliber and age of weapons seized by security officials also sheds light on their journey into the hands of a murderer. Analysts have long known about the lively trade in firearms into Brazil from neighboring Argentina, Bolivia, Colombia and, most importantly, Paraguay. Surprisingly, police intelligence have never once reported a single firearm from Venezuela, despite the fact that the country is purportedly a major producer of AK-47s. The Paraguay case has a lengthy back-story. In the mid-1990s, Brazilian federal police registered a sharp increase in domestically-manufactured weapons trafficked from Paraguay. This was associated with a massive increase in legitimate imports from Brazil (between 1994-1997). Paraguay imported 65,718 firearms in 1995, 58,253 in 1996 and 34,752 in 1997 – far more than their domestic needs. Brazil declared a formal moratorium on exports, which resulted in an immediate decline in trafficked Brazilian weaponry. To this day, there are reports of similar activity. Ultimately, most of the guns seized in the state of Rio de Janeiro were originally manufactured in Brazil. The most significant source is Brazil's largest manufacturer, Taurus. In 2015, the Secretary for Public Security estimated that about 40 percent of all guns seized were made by the Porto Alegre-based firm. Other big Brazilian gun makers, such as Rossi and Imbel, are not far behind and account for a decent share of collected handguns. Weapons from Argentina, Austria, Belgium, China the Czech Republic, Germany, Israel, Spain, Turkey and, of course, the United States are well represented. Firearms data is messy and it is challenging to get hard numbers. No one knows how many guns are officially registered in the country. The best estimate is that there are upward of 17.6 million firearms in circulation, at least half of which are illegal, but it is difficult to be sure. One of the reasons for this uncertainty is that the National System for Firearms and the National Military Management Arms System are still not fully operational. Complicating matters, the Disarmament Statute signed into law in 2003 was supposed to improve registration and investigation, yet implementation was resisted by state authorities and gun rights activists from the outset. A key step to preventing gun violence is honestly acknowledging the scope and scale of the problem. Too often public authorities blame cross-border traffic when the source of firearms is much closer to home. While Rio de Janeiro has registered some improvements in public security since 2009, public authorities and citizens cannot be complacent. At a minimum, investment is needed to improve data collection on firearms and to make such information public. The military, federal and civil police, in particular, must share data and improve firearms and ammunition tracing. All security entities also should urgently strengthen their stockpiles to avoid diversion. Most important of all, the 2004 Disarmament Statute must be strengthened, and not watered-down.